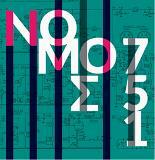 Slovenly Recordings proudly presents the debut vinyl offering from Greek punk prankster George Fotopoulos, doing business as electro-punk outfit NOMOS 751. This self-titled LP houses more music than should be legally permissible on a single album, with 17 tracks of tricky compositions propelled by rinky-dink synth and programmed percussion ranking at zero acidity on the PH scale for Phat Beats. Having previously rotted our minds in the mid-aughts with his Thessaloniki budget rocker crew KOMODINA 3, Mr. Fotopoulos has developed and perfected a seizure inducing sonic smorgasbord of complicated and hilarious racket and punk rock polyrhythms that sounds like your favorite Stranglers LP played at 45rpm, or perhaps backwards, or at least in Greek. In fact, the tongue is so twisted that its barely recognizable as humanoid, and we therefore spaced adding the Mondo Mongo imprint to the jacket. Enjoy the gibberish whatever youre capable of computing: theres a giant, full color newsprint poster housed in the jacket with lyrics printed in both Greek and English, for the curious and / or literate.Comes with giant full color double sided newsprint poster!